Three perfect nights in July provided opportunities to capture the night sky at popular sites in Banff National Park. When the weather forecast in mid-July looked so promising I made an impromptu trip to Banff to shoot nightscapes and time-lapses under unusually clear skies. Clouds are often the norm in the mountains or, increasingly these days, forest fire smoke in late summer. But from July 15 to 17 the skies could not have been clearer, except for the clouds that rolled in late on my last night, when I was happy to pack up and get some sleep. My first priority was to shoot the marvellous close conjunction of the Moon and Venus on July 15. I did so from the Storm Mountain viewpoint on the Bow Valley Parkway, with a cooperative train also coming through the scene at the right time. This was the view later with the Milky Way and Mars over Bow Valley and Storm Mountain. The next night, July 16, was one of the most perfect I had ever seen in the Rockies. Crystal clear skies, calm winds, and great lake reflections made for a picture-perfect night at Bow Lake on the Icefields Parkway. Above is a 360° panorama shot toward the end of the night when the galactic centre of the Milky Way was over Bow Glacier. Streaks of green airglow arc across the south, while to the north the sky is purple from a faint display of aurora. This is a rare appearance of the unusual STEVE auroral arc on the night of July 16-17, 2018, with a relatively low Kp Index of only 2 to 3. While the auroral arc was visible the ISS made a bright pass heading east. This is a blend of a single 15-second exposure for the sky and ground, with seven 15-second exposures for the ISS, but masked to reveal just the ISS trail and its reflection in the water. The ISS shots were taken at 3-second intervals, thus the gaps. All with the Sigma 20mm Art lens at f/2 and Nikon D750 at ISO 6400. Taken from Bow Lake, Banff National Park, Alberta. The unusual STEVE auroral arc across the northern sky at Bow Lake, Banff National Park, Alberta on the night of July 16-17, 2018. The more normal green auroral arc is lower across the northern horizon. But STEVE here appears more pink. The STEVE aurora was colourless to the eye but did show faint fast-moving rays, here blurred by the long exposure. They were moving east to west. The Big Dipper is at left. The lights are from Num-Ti-Jah Lodge. This is a single exposure for the sky and a mean-stacked blend of 3 exposures for the ground to smooth noise. All 15 seconds at f/2 with the Sigma 20mm Art lens and Nikon D750 at ISO 6400. Earlier that night the usual auroral arc known as Steve put in an unexpected appearance. It was just a grey band to the eye, but the camera picked up Steve’s usual pink colours. Another photographer from the U.S. who showed up had no idea there was an aurora happening until I pointed it out. My last night was at Herbert Lake, a small pond great for capturing reflections of the mountains around Lake Louise, and the Milky Way. Here, brilliant Mars, so photogenic this summer, also reflects in the still waters. A blend of images to show the stars of the southern sky moving from east to west (left to right) over the peaks of the Continental Divide at Herbert Lake near Lake Louise, in Banff, Alberta. The main peak at left is Mount Temple. A single static image shows the Milky Way and stars at the end of the motion sequence. The star trails and Milky Way reflect in the calm waters of the small Lake Herbert this night on July 17, 2018. This is a stack of 100 images for the star trails, stacked with the Long Streak function of Advanced Stacker Plus actions, plus a single exposure taken a minute or so after the last star trail image. The star trail stack is dropped back a lot in brightness, plus they are blurred slightly, so as to not overwhelm the fixed sky image. The sky images are blended with a stack of 8 images for the ground, mean combined to smooth noise in the ground. All are 30 seconds at f/2.8 with the 24mm Sigma lens and Nikon D750 at ISO 3200. All were taken as part of a time-lapse sequence. Clouds moving in added the odd dark patches in the Milky Way that look like out of place dark nebulas. The reflected star trails are really there in the water and have not be copied, pasted and inverted from the sky image. They look irregular because of rippling in the water. A blend of images to show the stars of the southern sky moving from east to west (left to right) over the Rocky Mountains at Bow Lake, in Banff, Alberta. The main peak at centre is Bow Peak. Crowfoot Glacier is at far left; Bow Glacier is at right below the Milky Way. A single static image shows the Milky Way and stars at the end of the motion sequence. The star trails and Milky Way reflect in the calm waters of Bow Lake this night on July 16, 2018, though they appear large and out of focus. This is a stack of 300 images for the star trails, stacked with the Ultrastreak function of Advanced Stacker Plus actions, plus a single exposure taken a minute or so after the last star trail image. The star trail stack is dropped back a lot in brightness, plus they are blurred slightly, so as to not overwhelm the fixed sky image. The sky images are blended with a stack of 8 images for the ground, mean combined to smooth noise in the ground. All are 30 seconds at f/2 with the 15mm Laowa lens and Sony a7III at ISO 3200. All were taken as part of a time-lapse sequence. 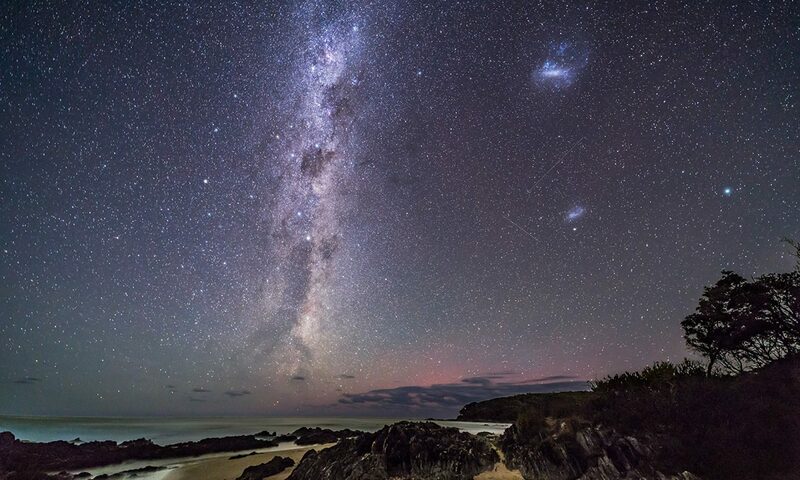 Bands of airglow add the green streaks to the sky. The stars trailing as they move east to west (left to right), ending with the Milky Way and Galactic Centre (right) over Storm Mountain and the Vermilion Pass area of the Continental Divide in Banff National Park, Alberta. Mars is the bright trail at left. Saturn is amid the Milky Way at right. This was July 15, 2018. The lights at left are from the Castle Mountain interchange at Highways 1 and 93. This is a stack of 8 exposures, mean combined to smooth noise, for the ground, plus 200 exposures for the star trails, and one exposure, untracked, for the fixed sky taken about a minute after the last star trail image. All 30 seconds at f/2.8 with the 24mm Sigma lens, and Nikon D750 at ISO 6400. The frames were taken as part of a time-lapse sequence. Dynamic Contrast filter from ON1 applied to the ground, and Soft and Airy filter from Luminar applied to the sky for a soft Orton effect. At each site I shot time-lapses, and used those frames to have some fun with star trail stacking, showing the stars turning from east to west and reflected in the lake waters, and with a single still image taken at the end of the sequence layered in to show the untrailed sky and Milky Way. But I also turned those frames into time-lapse movies, and incorporated them into a new music video, along with some favourite older clips reprocessed for this new video. Banff by Night (4K) from Alan Dyer on Vimeo. Enjoy! And do enlarge to full screen. The video is also in 4K resolution. What a wonderful starry Saskatchewan Summer! Thank you so much! You sure know how to capture the magic of the universe. Stunning photography Alan! Thank you so much for this post Alan – your images are breathtaking! I lived in Canmore for awhile, and in Alberta since I came to Canada in 1967. Now I live in Victoria and, while I love my new home and adore living by the sea (my 48-year goal! ), photos like these make me realize that the mountains did get into my blood in those years – and I miss them! Amazing memories of Aurora, which we don’t see here, and Mountains, which we don’t have here. Amazing is right! You really have a very special talent & these photos are phenomenal!